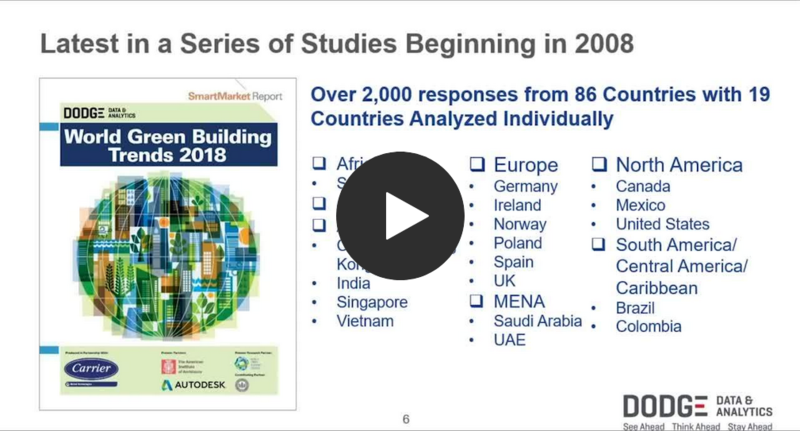 Dodge’s recently published World Green Building Trends 2018 SmartMarket Report provides a comprehensive look at the level of green building activity, influences on the green building market, business benefits of green and use of green products and services across all players in the construction industry in 19 global markets. This webinar focuses on one slice of that overall study, the responses of owners and contractors in the U.S. This presentation provides attendees with a glimpse of the priorities that are driving green investments in the U.S. from an owner perspective and the engagement of contractors in achieving green goals. It contrasts the findings, not just between these two players, but also with the larger global findings to create a clear, specific portrait of this market for green, how it differs from other markets around the globe and the differences between owners and contractors when it comes to green building.